Managing an investment portfolio is a very personal matter. Consequently, the most important consideration is to design a portfolio that meets your own unique goals, objectives and risk tolerances. Everyone is different, and consequently, every investment portfolio can and should be appropriately different as well. Stated more straightforwardly, I do not believe in cookie-cutter or one-size-fits-all approaches to portfolio design. In the same vein, I believe that investment portfolios, especially retirement investment portfolios, should be designed and constructed to meet the specific needs of the individual it is built for. In some cases the objective might be current income and safety. In other cases the objective might be the necessity to earn the highest possible rate of return. Importantly, the most appropriate objective for each individual will often be driven by factors that are external to the portfolio itself. Two of the most important external factors are the size of the portfolio relative to the investor’s needs, and/or the amount of time the investor has before entering the withdrawal phase. These important factors are the major contributors regarding whether the individual will be required to harvest principle upon retirement, or whether they will be able to live comfortably off of the income their portfolio can prudently generate. Of course the optimum scenario belongs to the prudent planner and disciplined saver that started early and built up a portfolio over time that is capable of generating more than enough income to live off of during retirement. More simply put, the larger the size of your portfolio, the more options you have. For example, if you have amassed a portfolio that is large enough to generate more income than you need to live off of, you can position your portfolio as riskless as possible if you so choose. Nevertheless, and with the above stated, this article is oriented to those investors that have had the good fortune to amass assets large enough to comfortably live off of in retirement. However, the specific size that a portfolio needs to be will also differ from one individual to the next. Some people desire or require lavish lifestyles, while others will be more modest with their needs. Regardless, the primary focus of this article will be on implementing portfolio design principles that apply best practices for achieving yield or income. Establishing a realistic assessment of available current market yields should be the first step that every investor investing for income should take. From my perspective, this takes precedence over calculating the yield you require from your portfolio in order to meet your needs. Therefore, I believe the best place to start is by examining the yields available from Treasury bonds, widely considered the least risky investment of all. An intelligent baseline and perspective of the yield you can realistically achieve on your portfolio is best established by being fully cognizant of the yields that the lowest risk investments provide. The following snapshot taken from Google finance shows the current yield on Treasury bonds at the time of this writing. After establishing the yields available from the lowest risk fixed income investments, it is then prudent to move on to and conduct a review of the lowest risk dividend paying equities. A review of the yields available on the Standard & Poor’s Dividend Aristocrats or the Dividend Champions provided by fellow Seeking Alpha author David Fish are a sensible place to look. However, there is an important consideration when examining the yields on dividend paying equities that is not required when examining fixed income yields. When examining the yields on blue-chip dividend paying stalwarts, it is important to evaluate current valuation. In other words, it’s important to determine what dividend yields are available from blue chips that are fairly valued. Additionally, it’s also important to evaluate available yields on blue chips with different growth potential characteristics. The following are representative examples of the current range of fairly valued higher yielding, moderate yielding and lower yielding Dividend Aristocrats or Champions. I believe these examples provide a realistic and prudent range of the yields currently available that can be utilized to construct a realistic and appropriate yielding retirement portfolio. Later in part 2 of this series, I will discuss different strategies of integrating fairly valued dividend growth stocks into retirement portfolios in order to meet various income objectives. 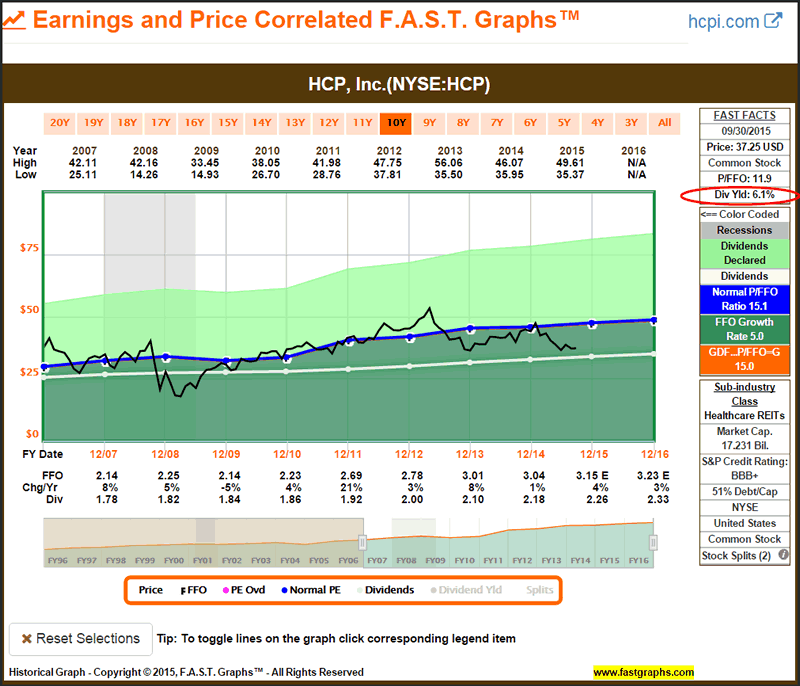 This first FAST Graph on HCP Inc is a healthcare REIT that I believe is attractively valued and offers a 6.1% current dividend yield. Even though HCP is a Dividend Aristocrat/Champion, meaning that is has increased its dividend for at least 25 consecutive years, there are risks associated with investing in REITs. Consequently, I would not suggest designing a portfolio solely consisting of REITs, but I do believe they can be judiciously included and represent an excellent method of enhancing the overall yield of a retirement portfolio. 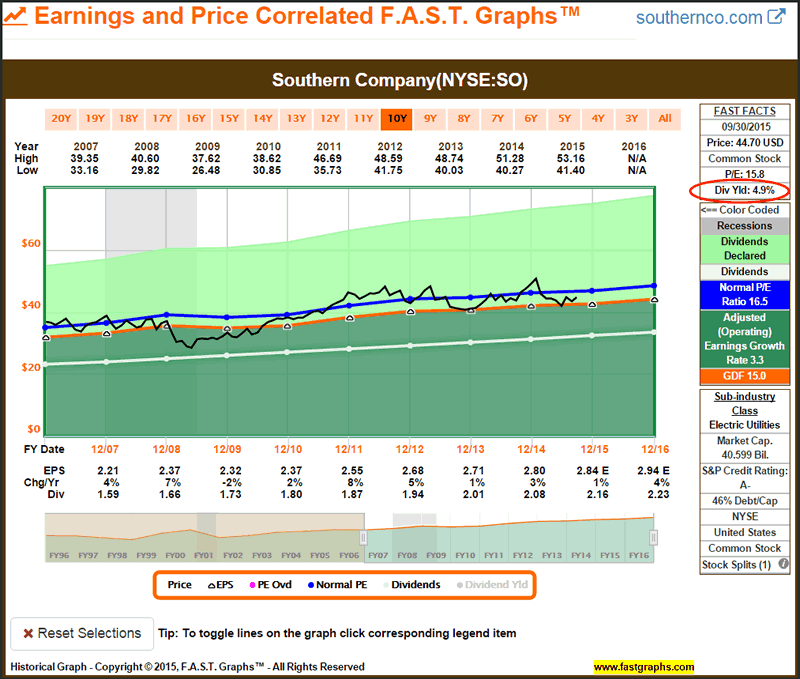 Southern Company is a high quality utility company that offers a current yield approaching 5%. However, utility stocks are notoriously slow growth entities, and as such, generally do not offer a high rate of capital appreciation or future income growth. Importantly, recent weakness in the stock market has brought many utilities from moderate overvaluation to current attractive valuation. Consequently, I consider fairly valued utility stocks important options that can also can be judiciously included and represent an excellent method of enhancing the overall yield of a retirement portfolio. 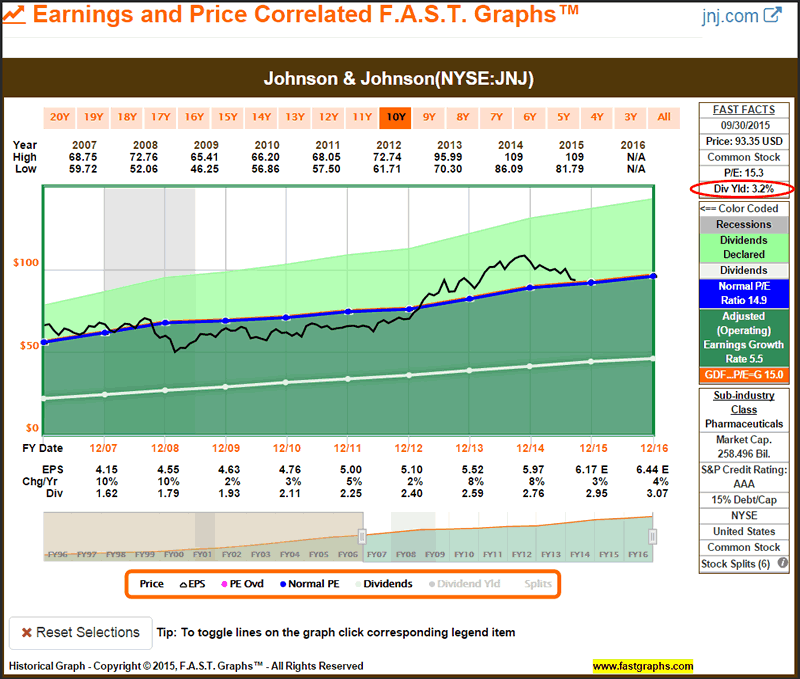 Johnson & Johnson is a Dividend Aristocrat and AAA rated blue-chip dividend growth stock that I believe is currently attractively valued and offers an above-average current yield of 3.2%. I consider fairly valued blue chips such as Johnson & Johnson to be solid foundational holdings in retirement portfolios. Good yield and a high degree of safety are the salient factors for this type of blue chip. Additionally, these types of blue chips when attractively valued offer moderate opportunities for capital appreciation and future dividend income growth. 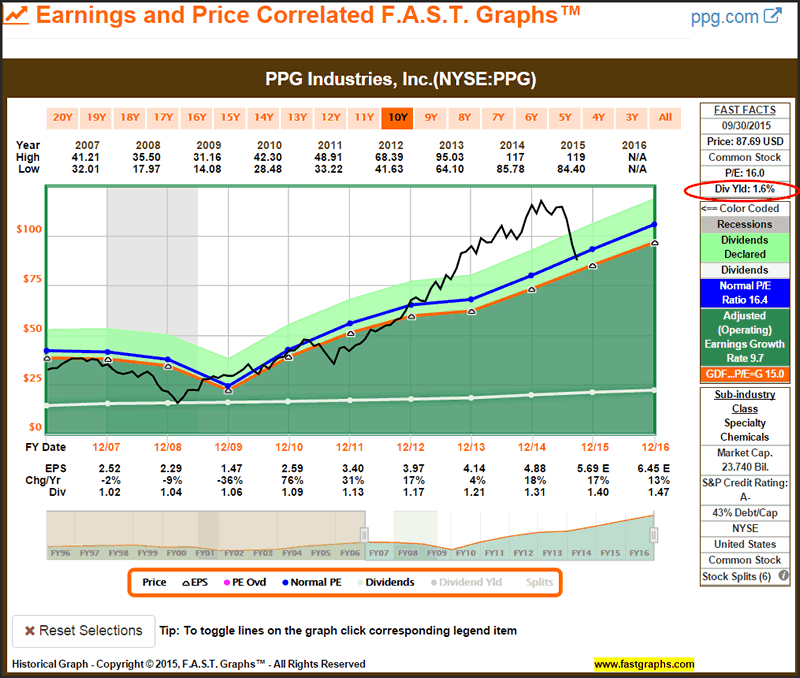 For those retired investors more in need of growth than income, faster growing, lower yielding dividend growth stocks such as PPG Industries Inc can be utilized. Although the yields on these types of dividend growth stocks are lower, their earnings growth rates are typically higher. Consequently, even though they offer lower yields, they can actually be riskier choices because their allure is primarily based on capital appreciation. At this point we now have a perspective on the yields that are currently and generally available from the most conservative fixed income and reasonably valued dividend growth stocks. Since these are, in theory at least, the lowest risk equity and fixed income options available, we can utilize this information as a guide towards assessing risk as we seek suitable income-producing investments. Additionally, we have discovered that the highest quality fixed income investments offer very low current yields even if we purchased the longest maturities. Therefore, if we are assessing investment opportunities in bonds, we should immediately recognize that any bond offering that yields in excess of our low risk baseline would logically contain higher risk. However, for the purposes of this series of articles, I will be excluding any further discussion on bonds and focusing exclusively on the dividend and dividend growth component of a retirement portfolio. Regarding the high-quality dividend stocks examined above, their current yields range from1.7% to 6%. However, as a general statement, growth expectations are higher with the lower yielding equities and vice versa. This is an important perspective depending on whether the individual investor is more in need of capital appreciation or current income. Finally, the important point behind this exercise is that we now have a clear understanding and knowledge of a reasonable and general range of dividend yields we can expect from high-quality equities. Therefore, later when we start talking about specific portfolio construction, we should be clear about the yield options available to us. Consequently, we are protecting ourselves from the temptation of yield chasing because we are unmistakably aware that anything outside our established prudent yield range implies significant risk. The second step after determining the range of prudent yields available is to calculate how much income we need to live off of in retirement. As previously suggested, this calculation will vary from one individual to the next. Once we have determined how much income we will need, we should take an inventory of any sources of income we have outside of our retirement portfolio. For most retirees this will be Social Security. However, income sources can also include pensions, rental income from real estate properties, interests in businesses, etc. These income sources should be subtracted from our gross income need in order to determine how much income our retirement portfolio needs to generate. For example, if an individual has determined that they need $75,000 worth of income in order to retire comfortably, and are receiving $25,000 worth of Social Security income, then their portfolio would be required to generate an additional $50,000 worth of income. Once this has been accomplished, the process of determining the yield that your equity portfolio must generate is a simple process. You simply divide your income need by your total portfolio value and that will determine the overall yield your portfolio must generate. Staying with the example presented above, if you had a $1 million portfolio you would simply divide your $50,000 supplemental income need by $1,000,000 and determine that your portfolio must yield 5%. Now here is where things get tricky, and also why this simple process is so important. Based on the previously discovered ranges of 1.7%-6% yields available from conservative equities, it’s imperative that we understand that a 5% yield target on our equity portfolio would require an aggressive high risk strategy. Consequently, we should immediately realize that we really only have limited realistic options if our goal is to have our portfolio fund our retirement without harvesting principle. Therefore, we must either be willing to accept a lower level of retirement income, or we must be willing to take on the excessive risk required to generate our 5% yield target. If neither of those options are acceptable, then we must accept the fact that we will be required to harvest assets in order to supplement and fund our desired standard of retirement living. For additional perspective, let’s utilize the same above example but with a larger accumulated portfolio. If the individual had accumulated a $2 million portfolio, and was receiving the same $25,000 per annum of Social Security and had the same $75,000 income need, the math works much better. In this case, if you divide the $50,000 supplemental income need by the $2 million portfolio value, you discover your portfolio only needs to earn 2.5% to meet your goal. Based on the range of high-quality dividend yields of 1.7%-6%, the 2 ½% target yield is both realistic and achievable. Even better, as I will illustrate in part 2 of this series, a 3% current yield is currently very achievable and would offer a total level of supplemental income greater than our established need. There are numerous advantages when a portfolio produces more income than is needed. These would include, but are not limited to, excess capital available for additional investment in order to provide a greater margin of financial security, and/or discretionary income that can be utilized for luxury purchases. Perhaps the sports car you always wanted but do not need, or a first-class luxury vacation. Although there are many investing strategies and philosophies that people can choose to follow, there is one that beats them all. Those wise and prudent people that started saving early in life are typically the ones that amass retirement portfolios capable of meeting their long-term needs. The simple act of putting away even a little bit of money every month reaps huge benefits over time. Unfortunately, far too many people lack the discipline or wisdom to execute a sound long-term retirement plan. However, those people that have been prudent enough to save and plan wisely for retirement are blessed with many incredible and important investing options. Perhaps the most important of all is that they are empowered to take on less investment risk at precisely the time when they shouldn’t be taking any risks. There is a general investing principle that applies. Investing for income, and investing in income producing investments are generally less risky than investing for growth or in growth-oriented investments. In the same vein, generating a growing income stream through investing in dividend growth stocks is more predictable than investing for capital appreciation or total return. High-quality dividend growth stocks with long histories of growing their dividends every year can continue to produce a higher rate of income even if the prices of their publicly traded stocks are dropping. In retirement, a predictable growing income stream is of paramount importance. As a bonus, I have prepared a free analyze-out-loud video on my website MisterValuation which provides a more in-depth and detailed look at the realistic range of current yields available on prudent and fairly valued dividend growth stocks. The primary focus of this series of articles is directed to retired investors that have amassed portfolios capable of producing the income they need to support themselves after they’ve quit working. The 2 primary principles I’ve articulated in this part 1 are offered as fundamental principles to consider and apply when designing or constructing their retirement portfolio. These principles can be utilized to reconstitute a portfolio that has previously been more growth oriented when in the accumulation phase. Additionally, these principles can be utilized to effectively manage the portfolios of already retired investors focused on income. Some readers might consider the advice offered in this article too fundamental or elementary. However, a lesson we can all learn from professional athletes is the importance of focusing on fundamentals. For example, I am an avid golfer and often take lessons from a professional instructor. I’m embarrassed to admit that for many years his instruction always started out by correcting my grip on the golf club. Over and over again, he would remind me that everything good with a golf swing happens and starts with the correct grip. I believe the 2 primary principles presented in this article are analogous to the successful management of a retirement portfolio, just as the proper grip is to a sound golf swing. In Part 2, I will present various strategies and approaches on how to construct a retirement portfolio that can produce the income you need commensurate with the amount of risk you are willing to assume. As I indicated in the introduction, there is no cookie-cutter or one-size-fits-all approach that works for everyone. Therefore, my objective will be to provide conceptual strategies that can be uniquely applied to meet each individual retired investor’s income needs. Disclosure: Long HCP, SO, JNJ at the time of writing.